-- On 16 October 2012 the Israeli organization Yazkern hosted dozens of veterans of Israel's 1948 "War of Independence" for a look at what that struggle really entailed. The veterans testified to what can only be called a conscious effort at ethnic cleansing -- the systematic destruction of entire Palestinian villages and numerous massacres. A documentary film by Israeli-Russian journalist Lia Tarachansky dealing with this same subject, the Palestinian "Nakba" or catastrophe, is nearing completion. It too has the testimony of Israeli soldiers of the 1948 war. These latest revelations lend credence to the claims of Israel's "new historians" such as Ilan Pappe who have written books based on evidence gleaned from government archives showing that, even before the outbreak of hostilities leading to the creation of the State of Israel, the Zionist authorities planned to ethnically cleanse as much of Palestine as possible of non-Jews. The aim of Yazkern's effort at truth-telling is to break through the sanitized "mainstream nationalistic narrative" of 1948 and the accompanying denial of any legitimate Palestinian counter-narrative." -- OK. The Israelis were savages in 1948 and only a small minority will admit it. What about after "the War of Independence"? As it turns out, the ethnic cleansing never stopped. Conveniently, the long-standing denial that it ever started has helped to hide the fact of its on-going nature. Yet just this week we received the news that Defense Minister Ehud Barak has given the order to demolish eight Palestinian villages with some 1,500 residents in the south Hebron hills. The excuse offered by Barack is that the land is needed for military training exercises. According to the "new historians," this is a standard Israeli government cover for ethnic cleansing. Sure, for a couple of years the Israeli army will use the land that held the demolished villages. Then, almost inevitably, the area becomes the site of a new Israeli Jewish settlement. 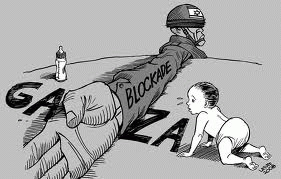 -- On 20 October 2012 Al-Jazeera reported on Israeli documents showing that between 2008 and 2010 the Israeli army allowed food supplies into the Gaza Strip based on a daily calorie count that held the basic diet of a million and a half people to a point just short of malnutrition. According to the Israeli human rights organization Gisha Legal Center for Freedom of Movement, "the official goal of the policy was to wage economic warfare which would paralyze Gaza's economy and, according to the Defense Ministry, create pressure on the Hamas government." Actually, this bit of savagery predates 2008. Back in 2006 Dov Weissglass, then an...advisor to Prime Minister Ariel Sharon, stated that "the idea is to put the Palestinians on a diet, but not to make them die of hunger." Of course, precedents for this can be found in the treatment of European Jews in the 1930s and 1940s. One assumes that Mr. Weissglass was aware of this. However, just as with the barbarism practiced in the "War of Independence," in this case too, there is a well-practiced capacity for national denial. According to Gideon Levy writing in Haaretz, "the country has plenty of ways...of burying skeletons deep in the closet so that Israelis shouldn't be overly disturbed." The military authors of the document that turned Weissglass's hideous "idea" into savage practice, operated in "a country afflicted with blindness." Just so the present Israeli government does not worry about public unease over the fact that it is slowly but surely destroying the Gaza sewage system and rendering its water supply undrinkable. -- Then there are the petty acts of cruelty that can be considered telltale signs of savagery. For instance, the fact that Israeli customs officials held back the the exam sheets for the October 2012 College Board tests bound for the West Bank graduating high school seniors. AMIDEAST, the organization that serves as the testing agency for the Palestinian territories, had made sure the Israeli authorities had the tests in their hands weeks in advance. Nonetheless, in an apparent act of petty vindictiveness, the customs officials held on to them until AMIDEAST had to cancel the exam. One observer has asked the question, "what does the SAT [tests] have to do with Israeli security?" Well it might be that, in the mind of a savage customs official, the more college-bound Palestinians from the Occupied Territories, the more articulate witnesses to Israeli oppression. On the Gaza side of the equation, the U.S. was forced to cancel a small scholarship program for Gaza college students because the Israelis refused to let the students leave their open-air prison, even if only to go to a West Bank school. For anyone who might want to follow the grim procession of Israeli oppressive and barbaric acts on a day-to-day basis, I recommend the website Today In Palestine. In the face of this persistent savage behavior on the part of Israel, that country's public support has finally begun to slip in the United States. Most recently, 15 prominent church leaders, representing major Christian denominations, wrote an open letter to Congress calling for "an immediate investigation into possible violations by Israel of the U.S. Foreign Assistance Act and the U.S. Arms Export Control Act, which respectively prohibit assistance to any country which engages in a consistent pattern of human rights violations...We urge Congress to hold hearings to examine Israel's compliance, and we request regular reporting on compliance and the withholding of military aid for non-compliance." So far the Congress has turned a deaf ear to this request, but the Zionist reaction was loud and clear. Leading the way in this effort was the head of the misnamed Anti-Defamation League (ADL), Abraham Foxman. Charging the Christian leaders with a "blatant lack of sensitivity," (one might ask just how sensitive one is supposed to be to an oppressor?) Foxman decided to punish the offending clergy by refusing to engage in on-going "interfaith dialogue." The Zionist reaction to being called out for their own savage behavior is a classic example of denial. Having "big brains" is a two-edged sword for human beings. It means we can think all manner of creative thoughts and even exercise some self-control over our own inappropriate impulses if we care to try. However, it also means that we can be manipulated into thinking that we need not try -- that we are the victims even as we are oppressing others and that any criticism of our actions is just another example of our victimization. Israeli culture, and indeed the culture of Zionism generally, is one on-going project of self-manipulation to achieve just such a state of mind. And, to a great extent, it has succeeded. A recent poll taken in Israel shows that "a majority of the [Israeli Jewish] public wants the state to discriminate against Palestinians...revealing a deeply rooted racism in Israeli society." The Zionists are not the only experts in denial. The United States, Israel's chief ally, has always been good at this gambit as well. After the 9/11 attacks, any consideration of the possibility that United States foreign policy in the Middle East might have helped motivate the terrorism was anathema, and it still is over a decade later. Instead of taking a hard look at our own behavior we are simply expanding our capacity to kill outright in a violent fashion anyone who would challenge our policies. Our answer is targeted killings by drone or otherwise. A bit of savagery we learned from the Israelis. Machiavelli, who can always be relied upon to see the darker side of things, once said, "Whoever wishes to foresee the future must consult the past; for human events resemble those of preceding times. This arises from the fact that they are produced by men who ever have been, and ever shall be, animated by the same passions, and thus they necessarily have the same results."